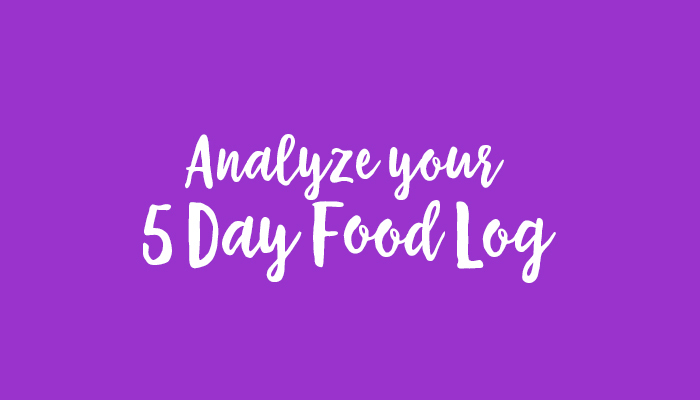 It is time to analyze your 5 day food log. Pull out those workbooks and food logs. You can record your answers to the questions below in your fillable workbook (pages 5 and 6) or in a notebook/journal. Before going forward with creating a healthy meal plan, you need to take the time to really consider what your daily diet looks like now. This is not about judgement or criticizing bad eating habits. This is about being open and honest with yourself about what you are eating. We will also consider issues with emotional eating, stress eating or self medicating with food. If you said, “I don’t need to do this, because I know I’m eating right” – I know that many of you are on track and doing your best. You should be very proud of that. If you are doing a great job with maintaining healthy eating habits, just look at this as a way to check-in on you efforts. We all need to check-in from time to time. 1) Did anything surprise you about keeping this 5 day food log or your food choices in general? Do you see areas that need improvement? 2) Now, it’s time to analyze your actual meals. Use My Fitness Pal, Calorie Count, Spark People or your tool of choice to analyze your log. How many calories did you eat per day? How many grams of carbs, fat and protein did you eat? If you didn’t record the actual amount of food you ate, make an estimate in terms of serving size. Do you have goals in mind in terms of how many grams of calories carbs, fat, protein, sugar or fiber you want to eat each day? How did your 5 days of eating align with those existing goals? Are you overeating any particular category of food? Fast food, carbs, sugary drinks, etc? 3) Today in the group, we will discuss servings and portion sizes today. Read these articles on suggested servings and answer the questions below. Gov Guide to Serving Sizes – MyPlate (click on the food groups on the left to review suggestions and serving sizes. Correct Portion Sizes: How to Keep Portion Distortion in Check – Print out/save the serving size comparison chart on this page (PDF). How many servings of fruit did you have over the course of 5 days? How many servings of vegetables did you have over the course of 5 days? How many servings of whole grains did you have over the course of 5 days? How many servings of healthy fats did you have over the course of 5 days? How many grams of sugar did you have over the course of 5 days? 4) What did the emotions/stress column of the 5 Day Log show you? Are you eating more so out of hunger or stress? How many times did you rate your hunger at 3, 2 or 1? Are you experiencing extreme hunger due to not eating enough food or waiting too long between meals? 5) Did you have eating goals before you started the log? What were those goals? Eating lots of protein, going Vegan, cutting down on salt, etc? Were you successful? Did you face challenges? 6) What did you learning about how you handle hunger? Are you eating when you aren’t actually hungry? What is the source of your desire to eat? This weight loss journey isn’t just about food. It’s also about quality of life. It’s about realizing what our relationship with food is. Being clear on how much food we are actually eating is important. However, understanding our impulses to eat (physical hunger vs. emotional hunger) is just as important. We want to feed our bodies and our emotions in the right ways. I hope that this 5 day food log gave you some things to think about and really helped you to see any areas you need to work on. It’s not just about losing pounds. We want to improve our health, our mindset and our overall lifestyle. Eating habits should fit into the overall picture of our lives and not be a distraction or a source of pain.